By now, you must know the feeling. Deportivo, Eindhoven and Istanbul have made sure you do. They have inscribed, indelibly, trauma on your psychology. They have turned your head, and things on their heads. Two-goal leads make you nervous; a cagey deadlock can be more assuring. It's almost as if you would prefer things to be be precarious going into a second leg of a Champions League tie. You listen to the commentators and experts talk about how Italian teams have been divinely--or naturally, depending on your preference--selected for survival, for getting a result, and for protecting it. A 2-0 lead going into the Camp Nou should be a commanding position, and it can be, and maybe it is. But that feeling still gnaws. Tomorrow, Milan will find themselves on the verge of a Champions League quarter-final berth at the expense of a team that believes they were divinely or naturally selected-- for keeping the ball and winning, something they consider their birthright, or a biological imperative. But three weeks ago Milan did the unthinkable for many. They comprehensively beat that team. Sure, teams have beaten Barcelona--Chelsea last season, for example--but the way Milan quelled the Catalonians was notable for its ease of manner. Barcelona had one shot on goal, and it was hopeful. Milan shunted Barcelona into bewilderment with a tactical setup that predicated itself on pressing constantly, and taking chances when they came. They came, and Milan took them twice, Kevin-Prince Boateng and Sulley Muntari scoring them, with Riccardo Montolivo and Stephan El Sharaawy creating them; this year's Milan, which is a team in transition, did what a team of Zlatan Ibrahimovic and Thiago Silva couldn't last year. Tomorrow's game will see a similar strategy of Milan trying to contain and capitalize, but it will be more difficult against a Barcelona team at home and now positively seething. In the last three weeks, they have been vanquished by Real Madrid and Milan--twice by the former. "It will be a heated environment, with a 100,000 people," said Milan CEO Adriano Galliani, about to depart for Spain from Milan's Malpensa airport. "We must not think we're 2-0 ahead." Galliani has cheerfully admitted in the past that he has often left his seat when things have gotten too tense for Milan. Those with a tenacious memory will remember Galliani chose to flee in the final minutes of Milan against Liverpool in the Champions League Final of 2007. It was too much for him to contemplate that Liverpool could somehow do what they did in Istanbul, or what PSV almost did days before that Final, or what Deportivo did a year earlier. It didn't turn out that way that night in Athens as Milan held on at the end for a 2-1 win. Yet, even sitting on a 2-0 lead, in the 88th minute, you feared, and when Dirk Kuyt scored in the 89th, you feared the worst. The comebacks of Deportivo and Liverpool, in particular (despite the panic, Milan still got past PSV in 2005), desecrated Milan's interiority during those years. It turned them inside out, and it showed teams that they were vulnerable. After that Final in Istanbul, Carlo Ancelotti, pallid from nerves and nicotine, lamented that "six minutes of madness" had cost Milan the Final against Liverpool in Istanbul. There was, then, something irrational about what had happened: the Liverpudlian goblins had hoodwinked Milan out of what they believed was their triumphant destiny. The looming question is, do these destinies subsume subsequent ones? That is, if a preceding group or generation of players failed, will successive ones too simply because they play for the same club? Is there a narrative, a guiding script, a sense of fatefulness that grips players and proceedings? Do not England just fail at penalties because they are terrible at them? Did not Spain underachieve for all those years merely because they didn't have a generation of players so comprehensively talented as the current one? And did not Inter finally achieve in Europe with the right mentality under Jose Mourinho? Admittedly, it is wrong to assume that the weight of history isn't onerous; that is to say, at some level England do indeed feel the expectation to succeed on penalties quite acutely, but they need not be resigned to their demise. Why should Milan disintegrate like they did in Istanbul or the Riazor? After all, what does Stephan El Sharaawy, a 20-year-old rising star, have in common with Andriy Shevchenko, other than Milan, the linchpin of success over the years? El Sharaawy's time at Milan will be determined by the peculiarly modern pressures of a perpetually changing football world, through which the youngster will have to negotiate his own way. Captain Massimo Ambrosini may be the sole survivor in the starting XI from that surrender in Istanbul, but, more crucially, and decisively, the club's hierarchy, its philosophy of winning still endures. Milan has briskly remodeled itself for relevance in a football world about to change profoundly--so we're told--with Financial Fair Play's introduction. This young team--indecently young, and not just by Milan's standards--has a chance to inaugurate something, an era. It was only last year that Milan came shockingly close to squandering a 4-0 first-leg lead against Arsenal, a brilliant save from Christian Abbiati denying a potentially crippling Robin van Persie goal in the return. However, even that team contained many players who have departed--no fewer than thirteen players left Milan this past summer. But critically, one man stayed. Coach Massimiliano Allegri, the deceptively diffident operator, has transformed this group into a winning one after many labeled it a ragtag bunch not worthy of the Rossoneri shirt. If Milan go through tomorrow, he will be supremely vindicated--and not just from a tactical point of view. Under him, Milan have that which all managers privilege: the right mentality. It is this mentality that has seen Milan surge up the standings from near the relegation zone into third. The vista of Milan's future for Allegri is his prime motivation: his chance to continue Milan's success, but in his own way, one that plans to nurture a group of world-class players, rather than purchase them, and one that isn't irretrievably linked to the past. 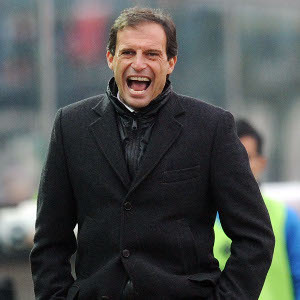 When asked about Milan's near-capitulation to Arsenal last season, Allegri answered bravely: "I am not thinking about that match. Tomorrow we will have two players born in 1992 [El Sharaawy and Mattia De Sciglio] and one in 1994 [M'baye Niang]. If we progress, it will be a historic night for this young team." Good work, Hasan. Enjoyed the reading. Thank you Xudong. Much appreciated. stopped reading at this point: "at the expense of a team that believes they were divinely or naturally selected-- for keeping the ball and winning, something they considers their birthright, or a biological imperative. " what kind of garbage are you peddling? you sound like a bitter barca hater rather than a milan supporter. It appears they are, but I meant it more as a compliment for Barcelona.